I’m sat here, in Birmingham, in my lunch break (which sadly verifies that I am back at work). According to the BBC weather forecast, it should have started lightly snowing at 9am this morning and it should have started snowing heavily 37 minutes ago, supposedly to continue all afternoon. It has done neither. Nor does it even look like snow; we lack both the requisite chill and the possibility of precipitation. I am considering a strongly worded letter of complaint to the director-general. I live near a Regency spa town so I think I can carry off the ‘disgusted of Tunbridge Wells’ tone adequately. If the BBC promised me snow, and heavy snow at that then I think it’s not unrealistic to expect at the very least, some form of falling wateryness. Hummph. On the plus side we can compensate with some lingering Christmassy sparkliness. We really hunkered down for Christmas this year; delicious food, pretty decorations, and piles of lovely crafty things for both of us. For the last few days we’ve spent the majority of our days at each end of the dining room table, with the test match clipping away in the background, he sketching in chalk pastel (and inadvertently shading our best tablecloth in delicate hues), and me supplementing the Christmas tree ornament collection. is Good King Wenceslas. 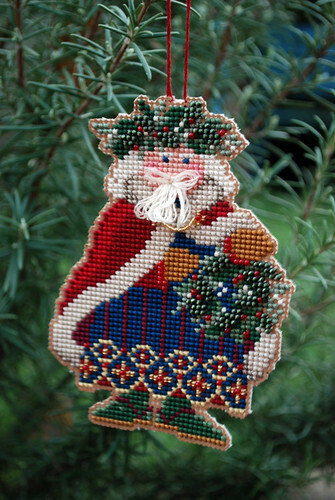 It is mostly counted cross stitch on gold card with a good smattering of beads and the fun of making a Father Christmas beard out of thread. As it’s only single sided the pattern suggested either leaving it plain or backing with card or fabric. Fresh from my Christmas tree skirt adventures with the steam-a-seam I went for some leftovers from Mum’s tree skirt, and for posterity I added the creation details. 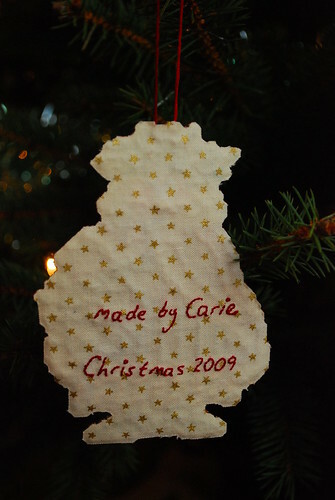 My freehand embroidery clearly needs work but I like that I’ll be able to tell which year I made this particular ornament. 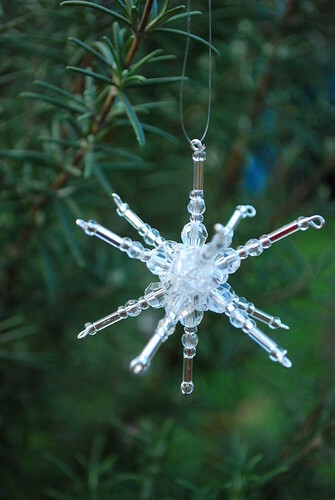 I’m thinking about making some sort of record of all of our ornaments so that I know when we bought them or made them – that idea needs a little more thought and isn’t something for this year anyway. Essentially I cut roughly around the cross stitch shape, cut a slightly larger shape out of fabric and steam-a-seam and, once I’d embroidered the backing, bonded the two. I then bonded the backing fabric to the back of the cross stitch with a fairly cool iron, and cut out the outline neatly. 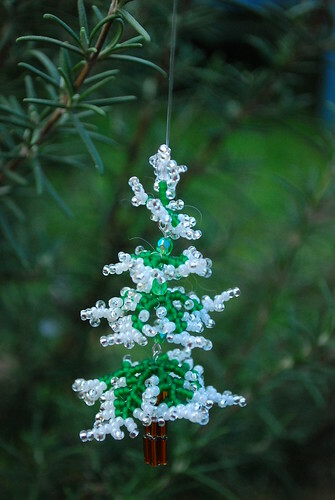 Next on the list of kits-I-have-bought-but-not-made-yet were two beading kits, both from Spellbound beads, that I think we bought at the artists materials show at the NEC in 2008. They’ve been in the drawer for a while. This is one of three Mini Aurora stars, which I can’t help but think look a little like something out of a Doctor Who Christmas special. 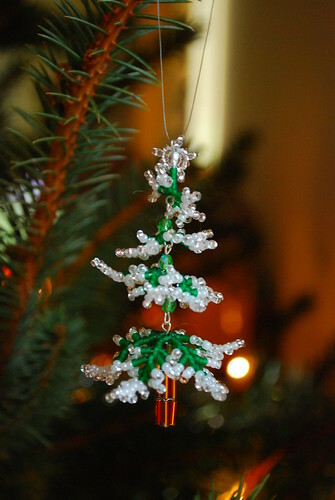 They are satisfyingly easy to make and twinkle in the lights on our tree. you can always make little christmas trees covered in snow. They are rather cleverly jointed so that the tree ripples in a breeze or passing nudge of the Christmas tree, which you can see a little better in this picture. From a glance out the window, this is all the glittery dusting of icicles that I’m going to get for this year – but on the plus side they don’t melt!